Roe Ethridge’s latest photobook, Sacrifice Your Body, is a searing exploration of the real making itself present in an artificial world, and provides plenty for Tim Clark to think about. There are few practitioners who apply the visual sensibility that underpins the ‘new school of synthetic photography’ as effectively as Roe Ethridge. Often imitated yet seldom bettered, the American artist has come to the fore in the post-internet era with his unique enquiry into the medium’s plastic nature. Through staged scenes and hybrid images, his work gets under the skin of the materiality that characterises life in the US. 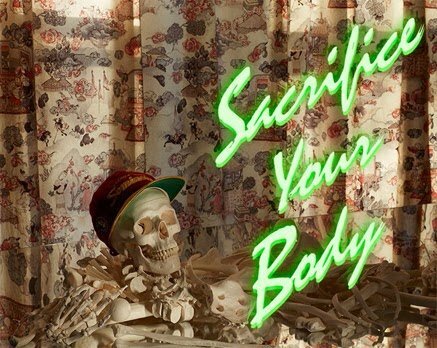 His new work, Sacrifice Your Body, sees Ethridge exploring his relationship with his mother. Vivid and fragmentary details of where she grew up in West Palm Beach County, photographed in a straight documentary style, are combined with outtakes from his assignments for Chanel and kitsch experiments in collage; Ethridge continues his restless search for meaning across different photographic conventions. Running parallel, the shorter but equally jarring narrative of his car – a bone-white Durango SUV – rolling into and being fished out of a canal, further undermines our capacity to fully comprehend the veracity of photographic events. Ethridge has commented that the second part of the book deals more overtly with his signature themes of fugue states and amnesia. Free-floating motifs such as the suburban mum, the phone call, the skull, sports references, are all used to reconstruct certain aspects of this mother-son relationship. There’s a sense of dissonance and discomfort in Sacrifice Your Body that recalls Andy Warhol’s line about getting things “exactly wrong”. Untrained, at least in the traditional sense, Ethridge is confident and assured in his output – as if appropriating his own photography and recontextualising it from the numerous spheres in which his images circulate.